The Golden Eagle recently launched a luxurious private carriage fit for your tsarist alter ego. The Romanov Suite features two bedrooms accommodating up to four guests, a private lounge and dining room, a complimentary minibar, a personal chef who will whip up Russian classics, chauffeur-driven transport and a private guide. 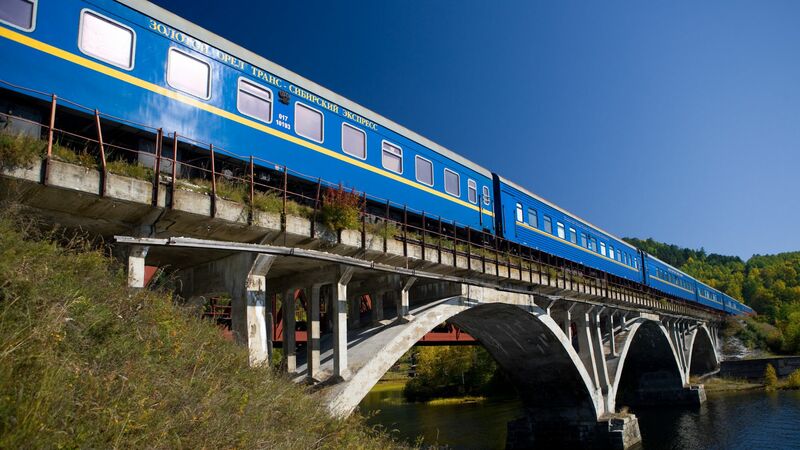 The carriage’s master suite is the grandest accommodation on the train, and boasts a king-sized bed, en-suite bathroom and large picture windows through which you can watch the splendour of Siberia unfold. The second bedroom is ideal for children and features twin single berths. For travellers who like going to extremes, you can’t beat the Trans-Siberian Railway. Its network of lines reaches across the empty but beautiful expanses of Siberia (pictured) between Moscow and Vladivostok, with extensions to St Petersburg and into Mongolia, China and North Korea. The main route is 9,289km and takes the Golden Eagle 12 days to traverse (it takes regular trains seven days non-stop). The railway was inaugurated in 1890 by Tsar Nicholas II and completed in 1916. There’s no departure quite like the one guests at Moscow’s Kazansky railway station enjoy. Russian Railways’ military-style brass band plays classic Soviet marching songs as an army of stewards in immaculate blue uniforms guide travellers to their assigned carriages, where waitresses serve champagne in crystal flutes. The best time to take the Golden Eagle Trans-Siberian is summer, when Siberia is a riot of wildflowers and verdant pasture. Once you leave the Urals, the train enters the vastness of southern Siberia, a flat landscape punctuated by expansive lakes, including Lake Baikal, the world’s deepest. As you dip into Mongolia, forests of birch give way to undulating hills and deep valleys dotted with yurts. A stop at Ulan Ede is an opportunity to witness a wrestling match and learn more about local culture. The Golden Eagle offers guests a chance to visit beautifully preserved monuments to Russia’s rich and often turbulent past. In Kazan, passengers visit the towering Kul Sharif Mosque, one of the largest mosques in the country, which was constructed in the 16th century as part of the Unesco-recognised Kazan Kremlin. In Irkutsk, guests enjoy a private operatic concert in the breathtaking mansion of Count Sergei Volkonsky, now a museum to the failed Decembrist uprising of 1825. On the outskirts of Ulan-Ude, there’s a visit to a traditional village of the Old Believers, a religious sect that was exiled to the depths of Siberia in the 1600s for not following church reforms; while in Novosibirsk, a century of rail history beckons from the city’s Museum for Railway Technology, a fascinating outdoor exhibition of towering, Soviet-era steam locomotives. The mesmerising expanse of Lake Baikal is a highlight of the journey, allowing intrepid travellers to take an early morning dip in crystal clear waters. Lake Baikal freezes over in winter, yet in summer, when it’s possible to see to a depth of 40m, the water temperature hovers around 10 degrees Celsius, offering a rather invigorating bathing experience. You’ll be rewarded for your courage with a few medicinal shots of vodka offered by the train’s white-gloved stewards. The Golden Eagle visits two cities that were completely closed to foreigners until relatively recently. Yekaterinburg, founded by Peter the Great in 1723, is best known as the city where the Romanovs were executed by the Bolsheviks in 1918. Less well known was its extensive complement of Soviet-era armament factories, which led to the city being closed to foreigners until 1991. There are areas on its outskirts that remain closed, where armaments are still manufactured. There is time to visit the sprawling Yekaterinburg Military Technology Museum, which, in addition to menacing-looking Hind military helicopters, armoured trains and modern jet bombers, exhibits fragments of the American U2 spy plane shot down while pilot Gary Power was recording images of the city’s factories. The final destination of the journey, Vladivostok, home to the Russian navy’s Pacific Fleet, was closed to Westerners until 1992. Matching the fascinating itinerary is world-class dining, something you won’t find on traditional Trans-Siberian trains. Regional and classic Russian dishes are interlaced in meals served by tuxedoed staff in two elegant dining cars. During traditional Russian feasts, guests learn about proper caviar presentation and the matching of vodkas infused with pine nuts and cranberry with zakuska, traditional accompaniments that include cured pork lard, pickled vegetables and holodet, a stewed beef jelly. After traversing thousands of kilometres pulled by modern electric locomotives, a Soviet-vintage steam locomotive takes over at Lake Baikal. Guests are able to climb the walkways of the electric locomotive, now at the rear of the train, and capture timeless scenes as the steam engine chuffs its way around the lake’s edge, the sun rising high across the waters, while locals wave from their lakeside dachas, or summer houses. Outside Irkutsk passengers spend an afternoon with the Shugantsev family at their traditional wooden dacha. After surviving the formidable heat of the family’s banya (sauna), they mingle in verdant gardens before sampling homemade honey and rose vodka over a home-cooked meal of hearty Olivier salad with potato, pickles and eggs, steaming solyanka soup, and pirozhki pastries. Art & Design Royal Style: What Did The Tsars Wear?